1 of 1 In a small bowl, stir together soy sauce, vinegar, sugar, fish sauce, sriracha and 1 tablespoon water. Set aside. 1 of 2 Heat oil in a large nonstick skillet over medium-high heat. Crumble in chicken and cook 2 minutes, breaking up large pieces with a wooden spoon. Stir in red pepper, sugar, garlic powder, ginger and sriracha. Cook 3 minutes, until no longer pink, stirring occasionally. Take off heat and stir in scallions and soy sauce. 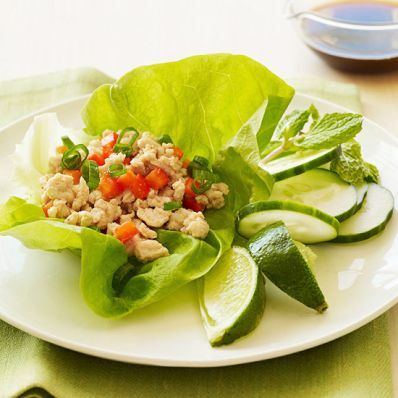 2 of 2 To serve, spoon 1/4 cup chicken mixture into each lettuce leaf and top with cucumber, scallions, mint and a squeeze of lime. Serve with Dipping Sauce and brown rice. Per Serving: 5 g fiber, 723 mg sodium, 26 g pro., 427 kcal cal., 17 g Fat, total, 44 g carb., 5 g sat. fat, 137 mg chol.